PORTLAND, Oregon - The Washington Wizards will arrive in Portland for a Monday night date with the Trail Blazers at Moda Center frustrated and hungry for a win. The Wizards are 0-2 after successive down-to-the-wire losses to Miami (113-112) and Toronto (117-113) as they begin a five-game road trip. Already, the players are beginning to feel inward pressure to get on the winning track. "We have to go out and win, and we realize that," Washington guard Bradley Beal. "We're pretty much done talking about it. Coach (Scott Brooks) is sick of hearing it. Ted (Leonsis, the team owner) is damn sure sick of hearing it. We just got to go out and win games, man." 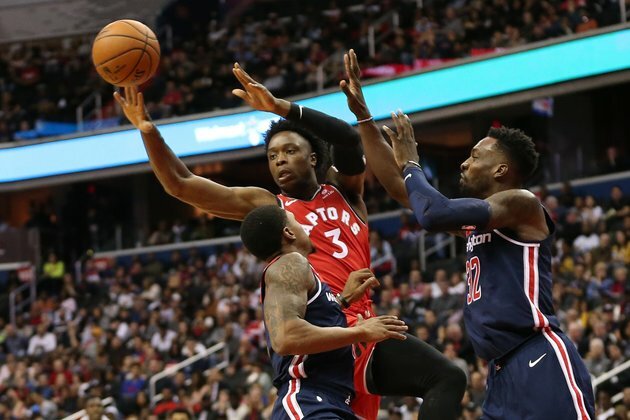 The Wizards' frustration boiled over in the fourth quarter of Saturday's loss to the Raptors when Brooks was ejected after a beef with an official. Afterward, the gentlemanly Brooks was apologetic. "I've been talking to our guys, that we have to play through whatever we think that's against us," Brooks said. "Just play through it. Quite honestly, I set a poor example. I'm disappointed in myself." Monday's game matches two of the best backcourt pairs in the NBA - Washington's Beal and John Wall and Portland's Damian Lillard and CJ McCollum. in the teams' last meeting on Dec. 5, 2017, Beal exploded for a career-high 51 points as the Wizards cold-cocked the Blazers 106-92 at Moda Center. It was the most points ever scored by a Blazer opponent in Portland. "(Beal) is a great player, but we can't let him go off like that again," said McCollum, who had principal defensive duties on Beal during the 51-point performance. The Blazers are off to a 2-0 start after home victories over the Los Angeles Lakers and San Antonio Spurs. In a 121-108 victory over the Spurs Saturday night, Lillard and McCollum warmed up for the showdown with Beal and Wall by combining for 53 points. Lillard and McCollum each made 9 of 15 shots from the field, and Lillard put on a near flawless offensive display with 29 points, nine assists and no turnovers in his 30 minutes. Portland coach Terry Stotts is attempting to use Lillard and McCollum together more often this season, with newly acquired reserves Seth Curry and Nik Stauskas now aboard to bolster the offensive output of the second unit. "Just being out there together - even in practice - helps make us more efficient," Lillard said. "The game comes easier when I can go off the ball, then I'm on the ball, and it's just like random." McCollum, a natural shooting guard, enjoys taking a turn at point guard to spell Lillard and allow him to spot up for some 3-point opportunities. "When we're on the court, there's problems (for the defense)," McCollum said. "A lot of problems. If we're taking advantage of spacing and opportunities to attack, if we're being efficient in how we're playing, we'll be a very successful team."